While I am not suggesting that this particular editor of The Fiddlehead is without his share of savagery, and while acknowledging that many writers prefer to be alone when formulating the words, the writing life goes way beyond those moments. A writer must engage with the world in order to write about it. Interruptions are to be welcomed and indeed should be sought after. No matter how we posit it, writing is a communal process. The Fiddlehead itself (like all literary publications) is proof of this. Why else would we gather a collection of writings and writers together in a designated place? Why else would any of these writers agree to publish their work? Why else would we need editorial input? Furthermore, the response to the published writing is, I believe, in itself a part of the process. As such, I welcome the arrival of The Fiddlehead Blog. 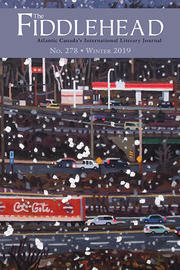 It provides a space to facilitate communication between Canada's longest lived literary journal and ...well, anyone else who cares to join in – family, friends, natural enemies, and, of course, the slightly savage. Your comments are to be welcomed. We look forward to hearing from you.